Creator… Take a seat and set your timer for 15 minutes. Start to breathe deeply: 3 counts in, 5 counts out. With every exhale sink deeper into your chair, relax your jaw, your tongue, your eyes, your shoulders, your legs, arms, feet, hands. Begin the dream you want to realize, take yourself by the virtual hand and guide yourself through the hallowed halls of your imagination to places that don’t require effort, only focus. To stratas of life filled with abundance and fecundity. See yourself, your job, your state of mind as nothing but radiant and carefree. 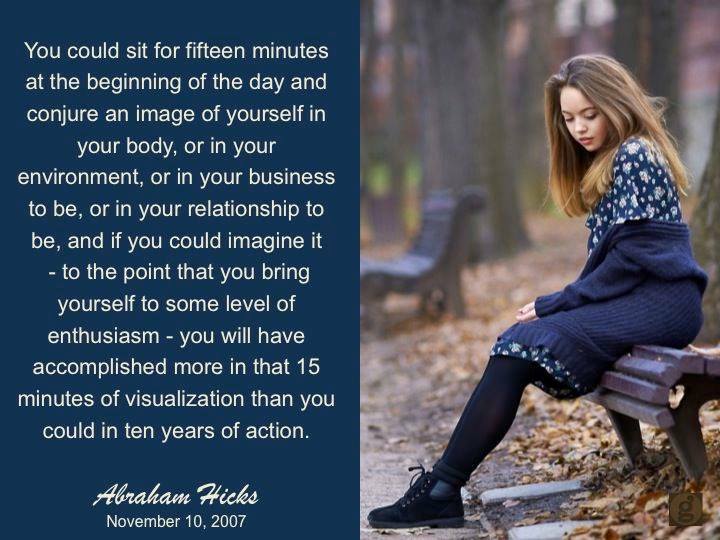 Take yourself on a virtual tour of your desires, allow yourself to get excited about what you’re imagining, all the way into the finish line of enthusiasm. And once your timer welcomes you back to this world, you will feel refreshed and renewed and guess what the super duper double darn bonus is? You will have succeeded in creating a momentum around your desires that is equivalent to 10 years of effort! Say What? Haha! Can it be that easy? Yes, it’s as easy as TAKING THE TIME to dream yourself forward into the next phases of the life you want to create!